How to Control the Scent When You Can't Control the Urge - the4pointer.com | Real Hunts. Unreal Stories. Anyone who has hunted recognizes that it is not always a glorious endeavor. There are some things that happen in the woods that should stay in the woods, and I’m not talking about losing your cool after missing a shot at the big one. On the other hand, many hunters could stand to read a few advice articles on the inglorious yet unavoidable things that occur. So when going #2 becomes your #1 priority where are you going to turn for advice? I suggest you turn here because what national publication is going to run a feature article on the front cover titled, “You’ve Avoided Soiling Your Pants, but You’ve Soiled the Area”? Can you see the cover of Field and Stream graced with an illustration depicting an article on “How to Avoid Exposure When You are Fully Exposed?” Or maybe North American Whitetail going with, “Controlling the Scent When You can’t Control the Urge” for the main read? It’s probably never going to happen which is the main reason why I’ve decided to tackle the subject. The best part about this topic is that we’ve all been there. We may not have all had a chance to hunt a world class buck or plant food plots, but I’d be very surprised if we haven’t all had to take a little timeout from glassing a hillside to conduct a little paperwork. It’s not a pretty topic, but from my point of view paperwork never is and that’s no excuse to ignore it. So this fall when you take to the woods to chase the wily whitetail try to remember a few of the following tips with the first tip being the most important. 1. It’s about you, not the deer. No one thinks about toilet paper until they notice that it’s missing. I’m a procrastinator but one thing I never forget in my last minute back-pack stuffing routine is a roll of toilet paper. In my mind one of the worst things that could happen when I am in the woods is to be caught in dire situation that requires the use of toilet paper. Sure, leaves could be an option but if you have the foresight to pack a little TP it makes an otherwise unpleasant experience a little less unpleasant. 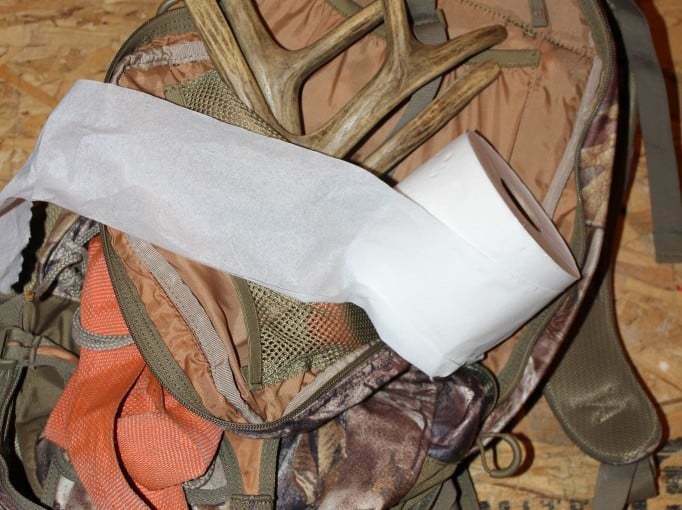 So, yes, making sure the box is checked next to toilet paper in your own pre hunt packing list is all about you and not about the deer. Don’t get caught empty handed. 2. Control the Scent. Hunters have been known to obsess over the topic of scent control. They spend hundreds of dollars on clothing that claims to contain or diffuse body scent, but it you’ve ever stood downwind when your scent-proofed buddy lets one fly you know the claims are false. So how do you control the scent when you can’t control the urge? That’s easy. You can’t, and likely the reason I’ve never seen an advice article on the topic. I’ve that most hunters, more often than not, wait until the urge can no longer be ignored. Unfortunately, this leaves no time to conduct scent control measures. To be honest, I’m not really sure what kind of scent control measures could be put in to practice. At this point in the process way too many other things have been put in to motion to even consider attempting to mask the scent. So worry not about controlling the scent and focus on the matter at hand. Finish the job and get back on stand. 3. Site Preparation. Just because you took a break from glassing the hillside doesn’t mean you stop hunting. Scoping out an area to conduct a little business should always include a search for a location where your hunting items can be safely stored yet well within reach in case The Big One comes waltzing by. Stranger things have happened and this is one thing you want to be ready for (along with making sure you packed the toilet paper). Tagging The Big One with your bum hanging out would make for a story of epic proportions and it’s one you want to be able to call your own. If it’s big enough (the deer) then you may just make it on the front cover of a magazine with a story like that. 4. Avoid Exposure. Have you ever noticed your dog doing circles in the yard until finding just the right spot to conduct business? I’m not exactly sure why they do this but I can’t say my own experiences in the woods would look any different to an observer. But that’s exactly why I do it – I’m hoping to avoid an observer. You’ve given the “all clear” to the hillside you’ve been glassing but don’t ever forget to check your six and the trees above you. Treestands are cheap and everyone has them so there’s no need to provide some cheap entertainment as well. Wow! Don’t you feel better equipped for heading to the woods this fall after reading that? I’d hate for you to miss out on any of this valuable information. The best thing you can do for yourself is to subscribe for email updates in the right hand column or like The4Pointer on Facebook. Thank you in advance!